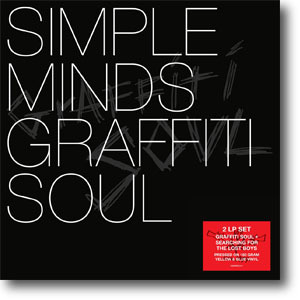 A limited edition pressing of Graffiti Soul was issued on Record Store Day 2019 to celebrate the 10th anniversary of the album. It was also selected for Record Store Day as the version of the album in the recent Rejuvenation 2001-2014 LP Box Set was only a single. It was felt that the full double album should receive the 180g, coloured vinyl treatment. The shrink-wrap included an additional orange sticker. 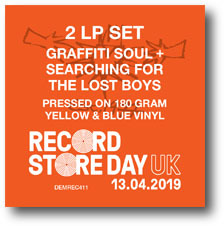 Exclusively for Record Store Day 2019, Demon Records proudly presents a re-creation of the limited edition gatefold 2LP set issued in 2009 - the original album, plus a bonus LP of nine cover versions recorded at the same sessions. Features the band's unique performances of songs by Neil Young, Magazine, Siouxsie & The Banshees, The Stranglers, The Call, Nick Lowe, Massive Attack, Thin Lizzy and the Beach Boys. Presented as a 2LP Gatefold, with Yellow and Blue 180g Vinyl.